You provide the room. We provide the rest. Opportunity to take full-length, practice SAT/ACT tests at your school. Exams are released by the test maker and administered by Frontier Tutoring under realistic conditions. We're available on your schedule: seven days a week, mornings, afternoons, and evenings. Some schools prefer to schedule practice SAT/ACT events on in-service days, while others prefer to schedule on weekends. We'll work with you to identify dates and times that work best for you and your students. We recommend scheduling both a practice SAT and ACT each semester. 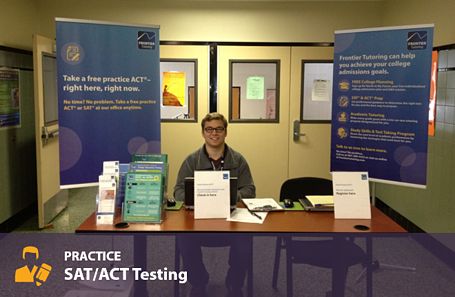 We make it easy to for you to inform your students and parents about your practice SAT/ACT events. You'll receive a turn-key marketing kit customized for your school, including posters, info cards, email/newsletter copy, and a sign-up webpage managed by Frontier Tutoring. We manage the entire student registration process and provide your team with regular updates on sign-ups. On test day, we check students in and manage all testing administration. After testing is complete, we email each parent, student, and counselor a detailed score report with a roadmap to score improvement. 1Based on free practice SAT/ACT and SAT/ACT prep program practice test sign-ups, July 2016-June 2017. Elective participants estimated based on ASD data from prior to mandatory College/Career Readiness Assessment.